Attention all nerds, put down that laptop and pick up this brilliant guide to tying 50 must-know knots. 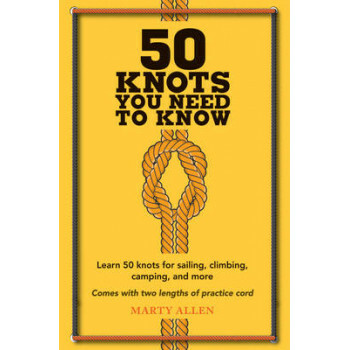 If you're unaware of the difference between a Cow Hitch and a Marlinspike Hoop or a Running Bowline and a Square Lashing, all will be revealed in "50 Knots You Need to Know." Packed with step-by-step instructions, discover how to tie knots to get you through any situation, whether it's nautical knots for sailing adventures or shanks and hitches for camping or climbing weekends. You will learn simple knot-making techniques that can be used for all your nerdly pursuits. And once you've graduated from the easy stuff you can move on to the more serious examples, such as a make-shift rope halter to you can use to tame a wild beast or strong knots for securing and tying things together. Also included are a couple of pieces of rope, so you can start tying knows right away. But be warned, it's VERY addictive!